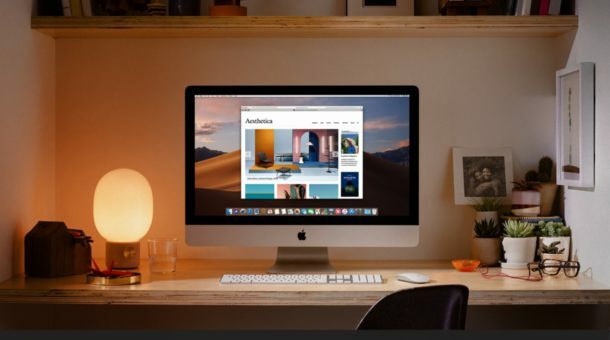 The updated iMac can now be configured to use the latest Intel CPUs with up to 8-Core i9 processors, a new Radeon Vega graphics card option, and a maximum of 64GB of RAM. The 21.5″ iMac is said to be up to 60% faster with the new CPU options, while the 27″ iMac is up to 2.4x faster with the new CPU options. The updated 21.5″ iMac with Retina 4K display starts at $1,299, while the updated 27″ iMac with Retina 5K display starts at $1,799. Additionally, the iMac Pro can now be configured at up to 256GB RAM and with a new Radeon Pro Vega GPU option. Orders for the updated iMac hardware begin immediately, with availability later in the month. Presumably the new iMac will ship with MacOS Mojave 10.14.4 preinstalled, which is currently in later stage beta development. The iMac updates come a day after Apple released updated new iPad Air and iPad mini hardware. Rumors persist that other updates to Apple hardware may appear in the near future too, including an updated iPod touch, possible updates to the 12″ MacBook line, updated AirPods, and possibly the release of a much anticipated wireless charging mat for iPhone and Apple Watch called AirPower as well. Apple has an event scheduled for March 25 which is widely reported to focus on the company announcing a new media content endeavor aimed at competing with streaming video services like Netflix. Typically Apple releases new hardware at these type of special events, but this time they appear to be clearing the hardware update deck ahead to focus the event on other topics.